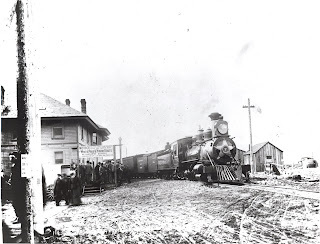 On August 29, 1898 Arthur Hallum tragically died in a railroad accident on the White Pass. He was only 39 years old, but the age of his death was strangely similar to that of his famous grandfather, Sir Arthur Henry Hallum who died in 1833. Sir Arthur was a poet and author friend of Alfred Lord Tennyson who wrote a monumental tribute to his friend, “In Memorium” in 1850. On August 27, 1897 it has been written that a Frenchman, unknown name, was tied to a stake, shot and hung as an example to thieves. Although this story cannot be corroborated, it was said that some lynchings did occur on the trail. In 1897 there were several U.S. Marshals in both Dyea and Skagway, so if this lynching did occur, it was not in town. Despite Skagway’s reputation for lawlessness, this period was mostly in the spring of 1898 when Soapy’s gang gained control. 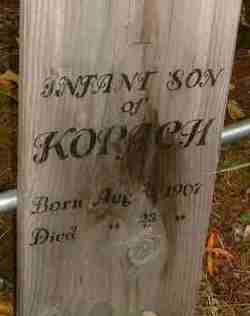 On August 23, 1907 the infant son of Emil and Lillian Hain Korach died and was buried in the Skagway Gold Rush cemetery. He must have been a twin because his brother, Edward, moved to Los Angeles and died in 1967 at the age of 60 according to the California death index. A website called drygoodsandwetgoods.com talks about their family. Emil was born in Hungary and ran the Bloom and Korach store in Skagway around 1905. The website says that they moved to Akron Ohio where they passed away. A rootsweb posting also said they were Jewish, but oddly, the headboard in Skagway has a cross on it. Perhaps some well-meaning Skagwegian decided to Christianize the Korach baby in a subsequent remaking of the headboard. On August 15, 1913 Harley Andrew Baker was born in Skagway. He was named after his uncle Harley Baker who died in Skagway in 1898 from meningitis at 3 1/2 years old and is buried in the Gold Rush Cemetery. Harley Andrew became the first Alaska born Catholic Priest. He died in Juneau in 1965 but is buried in the Skagway Pioneer Cemetery. 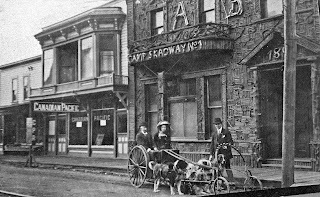 The Baker family stayed in Skagway until the 1930 census. Harley’s father, Elihu worked for White Pass as a brakeman. From a website called bakercemetery.com; a letter from Francis Baker, the first Harley’s mother; census reports. On this day, August 17, 1917 a large boulder fell down the mountainside and took out an engine. The Engineer was Walter Collin McKenzie and his 25-year old son, Robert Daniel McKenzie known as “Bert”, was the fireman. They were unfortunaly both killed as the engine rolled down the mountain. No other cars or engines were affected. In June 1908 the Baldwin Locomotive Works Co. of Philadelphia, delivered two specially designed narrow gauge steam locomotives that had been ordered by the WP&YR. Although Engine 68 was destroyed in 1917, the twin engine, No. 69 would spend the next 46 years puffing across rugged Alaskan and Canadian mountain ranges that had been conquered by the WP&YR. WP&YR officials recognized a need for additional motive power that would primarily be used to help pull or push freight and passenger trains over the steep grades encountered between Skagway and the summit over White Pass, where the track level rises more than two feet in every 100 feet of distance. At the time of completion Engine 69, at 134,369 pounds, was one of the heaviest narrow gauge, outside-frame locomotives built by Baldwin. It was capable of tackling grades of 3.9 percent and curves and radiuses of up to 20 degrees. The tractive power of 69 was equivalent to that of many standard-gauge engines and it was well-suited to running over rails weighing 56 pounds per yard. 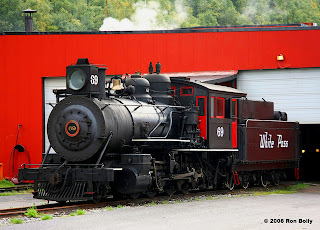 In the course of its now-100-year history, the venerable Baldwin 2-8-0 has served in two countries, has transported thousands for either fun or profit. 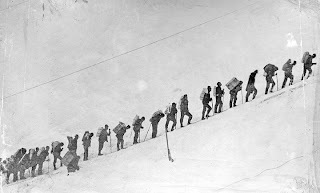 from Graves, The White Pass; Skagway death records; Weather underground photo. The British S.S. Islander owned by the Canadian Pacific Navigation company, collided with floating ice which cut through the port bow into the water-tight bulkheads and to the coal bunkers. The ship sank in 20 minutes. 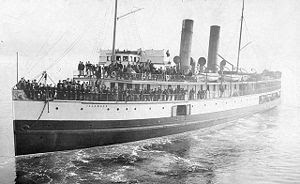 The crew of 62 men plus another 20 passengers all drowned. This occurred at 2 o’clock a.m. on Thursday August 15, 1901 between Douglas and Admiralty Islands. The report was written to Edward Scott Busby, the Canadian Custom Office in Skagway, by the Senior Purser in Juneau on August 17, 1901. On this day, August 13, 1905, James Hanson, otherwise known as Kebeth or “White Eagle” Kaagwaantaan, an Aleut from Sitka died in prison at MacNeil Island, Washington. He was convicted for the murders of a young couple, Bert and Florence Horton as they picnicked at a spot along the bay near Skagway, while on their honeymoon. That was on October 24, 1899. Kebeth was perhaps a bit unbalanced as he accused the Horton’s of a previous death, and decided to kill them out of retribution. He shot both and slit Florence’s throat. Bert and Flo were married a few months earlier in Lane Oregon, she was 19 years old and he was 25. Kebeth made his friends keep quiet about the murders but eventually one of them talked and Kebeth was convicted, but his sentence was commuted due to his mental state. 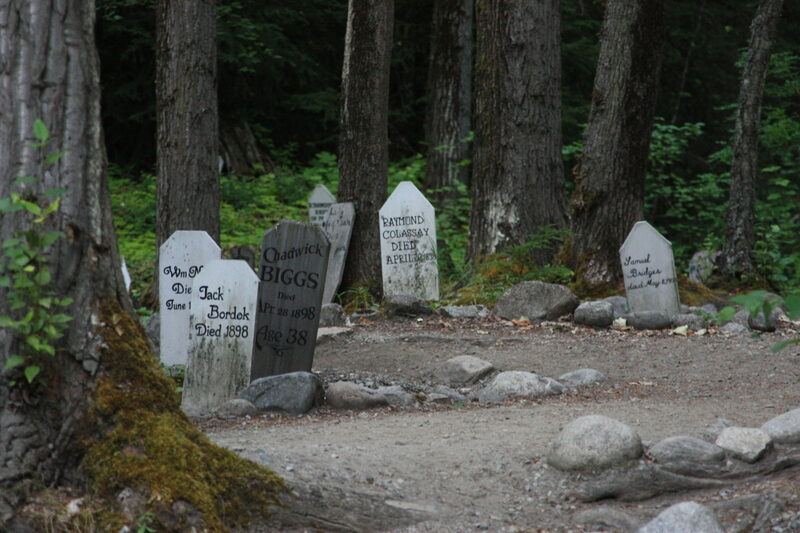 The Hortons are buried in the Gold Rush Cemetery. -from the Skagway Death Records and Thornton’s Ethnographic Study, 2004, p 189. Some Indians stole some baking-powder from a prospector’s camp. Turned out it was arsenic, perhaps put there deliberately, perhaps just supplies for refining gold. In any case, two Indians died. At that time, customary Indian law dictated that members of victims’ moiety or clan (Crow of the Klinkit Tribe) take steps to avenge the deaths, if not against the individuals actually responsible, at least against representatives of their moiety or clan. The debt could be paid by money or a death. When asked for payment, purportedly, the prospectors said no. At this point, as related by the 4 Nantuck brothers (Joe, Jim, Dawson and Frank), they shot two white prospectors on May 10 1898. One of these, William Meehan, died, while the other, Christian Fox survived and went to RCMP who subsequently arrested the four native brothers. 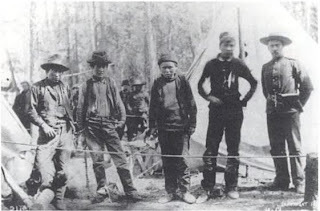 RCMP took the boys to Dawson where an extensive trial took place. Although they confessed, Canadian leaders felt the need to be lenient because of past cases and a change in attitude towards the First Nations people. 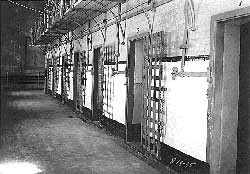 In the end, Frank and Joe died of consumption (TB) in jail during 1898 and the other two, Dawson and Jim were hung in Dawson on August 4, 1899.
from two books: Life Lived like a Story by Kitty Smith et. al. and Essays on the History of Canadian Law by John McLaren and Hamar Foster. On August 3, 1898, while building the White Pass & Yukon Route Railroad, Michael J. Heney, the company foreman and chief engineer was supervising some blasting at a place called Black Rock which is about 13 miles up the track from Skagway. As the explosion went off, a huge slab of rock slid down over two men. At first, rumors flew that there were more casualties, but in the end it was confirmed that there were just two. The company decided that there could be no better memorial to these two men than the rock and so a small memorial was placed there. Over the years the names of Al Jeneux and Maurice Dunn have been given for the two men, although in all the research, I have yet to find any historical reference to confirm those names. Are you interested in Alaska? Skagway is one small Alaskan town unlike any other. Its very name evokes images from the past of passion, crime, struggles and dreams of fortune. My name is Marlene and I work for the Municipality of Skagway in the Convention and Visitors Bureau (CVB). If you follow my blog I will revel you with the incredible but true stories that I discover. Every week at AB Hall (Skagway’s City Visitor Center) I meet many descendants of the gold-rushers who passed through Skagway in 1897-1898. In this blog I will unearth tales of ghosts that inhabit buildings; famous people who stopped here; murders only recently uncovered; missing people; shipwrecks; avalanches; merchants; romance; orphans and lost souls.